There are some dishes that are entirely evocative. The kinds of foods that, when you eat them, make you think of a dozen other things. For me, creamed corn is one of those things. I love creamed corn. I love it for its simplicity, the fact that it’s a dish based entirely upon the flavors of a single ingredient. I also love what it makes me think of. Crisp, cool nights. Fireplaces. Comfy sweaters. Orange and red Autumn leaves. The Indigo Girls’ “Southland in the Springtime.” Thanksgiving. Roast meats. Big group dinners with great friends. Don’t ask me to explain why these things come to mind. They just do. There’s no real logic to it. Of course, I also love the taste. Part of this stems from my undying adoration of creamy foods. I dream of the perfect creamed spinach. The sight and smell of a freshly-baked Gratin Dauphinois gets my pulse racing faster. A well-made Chicken à la King puts a smile on my face. I love pastas with rich, thick, creamy cheesy sauces. Unfortunately, cream sauces aren’t entirely the healthiest things in the world to eat too often. Which is something that my darling wife S, who is always trying to get me to eat more nutritiously, likes to remind me as often as humanly possible. 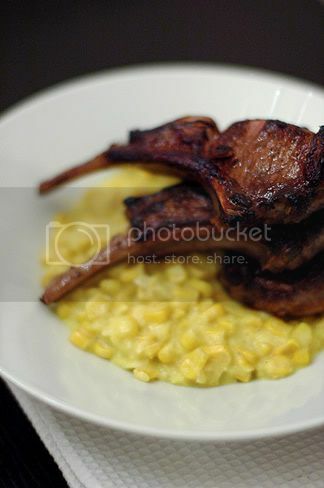 Which is why we both love Tom Colicchio’s Creamless Creamed Corn recipe. 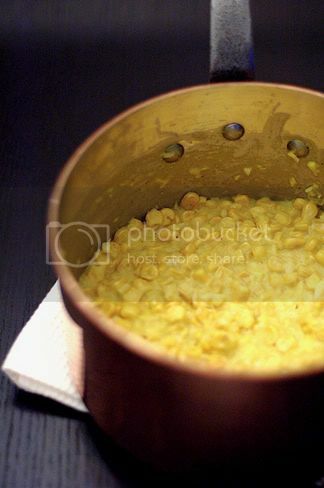 Here’s a way of making a sensuously delicious, super rich-tasting creamed corn without actually adding any cream. Colicchio’s recipe (which you can see here), however, calls for fresh ears of corn, something which you might not always have lying around the house. Over the past year or so, I’ve adapted the recipe, using frozen corn, which is something S and I always make sure we have a supply of in our freezer. That means we can enjoy this dish anytime we want. It’s also both easy and speedy to make. And very quickly become one of our favorite side-dishes to eat with, well, just about anything. Separate 200g of the corn. Defrost in boiling water. Strain the corn and put it in a food processor or blender with the 1/4 cup chicken stock and 1/3 cup water. Purée until smooth. Strain the corn liquid and set aside. Melt the butter in a high-sided sauce pan over medium-high heat. Sauté the onions and garlic in it until the onions are soft and then pour in the remaining 300g of frozen corn. When the corn gets warm, pour in the corn liquid. Lower the heat and cook for 7-10 minutes, stirring occasionally. I would like your opinion on this matter, if it is not too much to ask – have you compared canned corn vs frozen corn? Is there a difference in the texture? drooling. licking the screen. I want to marry your creamed corn. What a great concept. I ‘ve never heard of this recipe before. Glad to have learned something new today. Hope you’re having a great weekend! this dish is infintely better with fresh corn. You use the strained liquid and not the puree in the creamed corn recipe? ?